National museum comprises of two Buildings: pre-Islam era & past-Islam era. The first building, Iran Bastan Museum (meaning Ancient Iran Museum), houses pre-Islam era‘s objects and was built in 1937 by Reza Shah‘s order. The second building, Islamic Era Museum, was allocated to post-Islam objects. It was transformed into a museum after the Islamic Revolution of Iran, 1996. This post introduces the first building. All the objects on display in this museum have been systematically unearthed and chronologically displayed. So, we know which site they have been discovered in, who has unearthed them and which stage in prehistoric or post historic period they belong to. It‘s worth mentioning that no object has been bought to be exhibited in this museum. 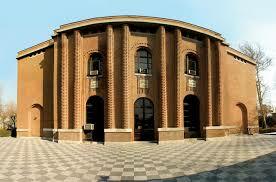 PRE-ISLAM BUILDING AT NATIONAL MUSEUM OF IRAN This museum is also known as Archaeological Museum of Iran. The objects in this museum are showcased on two floors. The oldest objects on display date back to prehistoric eras, which are displayed on the upper floor. Therefore, you are recommended to begin your exploration from this floor, which gets you acquainted with the most ancient items first. 6 UPPER FLOOR OF IRAN BASTAN MUSEUM: Ancient Iran Pottery Objects The oldest objects at this floor of the National Museum of Iran date back to lower Paleolithic period. Then, it ranges from this era to the latest period of the forth millennium BC. In other words, they cover a time span of the most ancient artifacts to the time just before the creation of writing skills in Iranian plateau. The number of objects displayed on this floor of Ancient Iran Museum exceeds 600 items discovered from prehistoric areas like Tappeh Sarab of Kermanshah Province, Tappen Alikosh of Khuzestan Province, Sang-e-Chakhmaq of Shahroud city, Tall-e-Bakon of Fars Province, Susa of Khuzestan Province, Sialk Tappeh of Kashan city, Tappeh Hesar of Damghan city, Tappen Choghamish and Bouhalan of Khuzestan Province, etc. Potteries from Susa dated back to 5th Millennium B.C. To help the visitors better understand the culture of this era, a model of a village house, three pottery making kilns, and a 4th-millennium BC reconstructed grave are provided at this floor. THE LOWER FLOOR AT IRAN BASTAN MUSEUM: Then, very ancient collections of potteries are displayed beginning from the 4th millennium B.C, decorated very uncomplicatedly to 7th century AD, when Iran entered post-Islam era. The potteries are in three different colors: red, buff and black. There are also various types of seals, clay tablets, figurines and ornaments. Bone-made and alabaster-made objects are also on display. There are also rayon‘s of various shapes and materials displayed next to each other. Ancient Iranian Figurine Made of Bronze The next series of objects are bronze works of the north, northwest and Luristan province. In Luristan bronze works‘ section, there can be visited samples of various kinds of objects used either in everyday life or ceremonies. In Achaemenians‘ section, there are various types of items on display. Some of the objects at this section are brought from Persepolis. Some are parts of palace walls, stairways, etc and others are the objects used at Achaemenian palaces by Persian Emperors. Others include stone bass relieves, glazed bricks, stone wares, bronze works, statues, columns, inscriptions and figurines. Decorated Ancient Iranian Potteries One can notice the Hellenistic influence in Iranian art right after the Achaemenian section in Selucids‘ section. There are lapis lazuli, potteries, stone and bone made objects in Seleucid period section reflecting this influence in some objects. More influence can be seen in the next section, Parthian period, where Greek gods are displayed in form of figurines. In addition, at this section, there are also glass wares, potteries, stucco and stone relieves ornaments and ceramics on display. 7 Remains of Salt Man from Ancient Iran Also at Parthian era‘s section, one whole showcase has been allocated to the Salt Man. He was presumably a miner digging out for salt before he was trapped in the mine and lost his life. Due to the nature of salt preserving living things for a long time, parts of his face and belonging are discovered and transferred to this museum making us familiar with the life, dress code, belongings, etc of the people in those years. The last section at the lower floor is allocated to Sassanian era, 3rd to 7th century A.D, where one can see the arts of pre-Islam at its best. There are glass wares, bronze works, stucco relieves, mosaic decoration, potteries, ceramics, ornaments and figurines.